A warm welcome to my July newsletter and especially those who have joined recently. Thank you to everyone who has been in touch over the past month. My council workload continues to be extremely busy, there are lots of challenges, frustrations (especially with some significant delays in the County Council responding on certain issues) mentioned below – but I am pleased to say there’s some good proactive community initiatives too. One observation I’ve made during the past few weeks is through talking to lots of people particularly in Kimberley over the past few weeks I am really impressed and struck by way people look out for one another where they live – a good spirit of neighbourliness – there are too many examples to mention – long may this continue! I hope that you find this edition stimulating and useful. I’m taking a break for a while in August, so the next newsletter (workload permitting) maybe in September – rather than in August. However in the meantime and as ever, if you have any feedback, comments, any issue you would like to raise or need help with personal casework, please get in touch. I reported last month that a number of residents had been in touch regarding the missing post box on Maws Lane – affecting people in the Beverley Drive and Stocks Road area Kimberley. I made representations about this and duly received a letter from the Royal Mail Group (below) confirming they would address this issue. On 6 July I started to receive messages from residents nearby to say that the post box had indeed returned. Thank you to everyone who got in touch and I’m pleased to be able to report a successful outcome here. I am very pleased to say that an exciting new business in opening in Kimberley on Saturday 18 August. The owner is Stacey Syson and the opening takes place on Saturday 18 August between 11am and 2pm. There will be lots of activities including Chloe and Marley from MTV Teen Moms (I have to admit I had absolutely no idea who they were until Stacey mentioned them to me). They will be coming to do photoshoot demonstrations and Mr Balloony will be doing balloon modelling. In addition to this Candy Carts will be giving out free chocolate pizza plus free cakes and drinks. There will be photoshoot experience offers and giveaways. Local businesses are offering discount vouchers and merchandise. Also there will be a tombola and all funds raised will go to the charity – Wish upon a Star. A resident on Edgwood Road Kimberley reported a faulty street light near their property. I duly reported this to the County Council under Hams ref 73156. I understand that this now been repaired. If anyone else has any faulty street light issues please let me know. …………”that applications relating to the conversion of the Maltings, new build town houses to replace the Brewhouse building and revisions to a small section of the phase one development which is underway went to Committee in February and were approved, subject to amendments to the original Section 106**** in relation to the Maltings and townhouses and changes to the materials to be used in the town houses, which were to be agreed with Chair. The materials have since been agreed with Chair, a smooth black brick to replace the proposed cladding. The applications relating to the Maltings conversion and the new town houses have not been issued yet as the revisions to the Section 106 have not been finalised. There are also applications to convert the kiln store building into two units and the kiln buildings in 8 duplex apartments. Discussions with the applicant are still on-going with these. They are likely to be delegated decisions at this point and will also need amendments to the original Section 106 for the whole of the site“. **** In effect a Section 106 agreement is a piece of local government terminology that refers to a developer agreeing to make a financial contribution to a local authority as part of the respective planning agreement. There is lots of hard work continuing behind the scenes on this exciting project with a group of volunteers currently working on detailed maps, routes, documents and consultation meetings with local parish councils, community groups. We have further meetings set up with Nottingham City Council in September, and we are in discussions with some significant businesses and employers in the north of Broxtowe and just across the border Amber Valley. A key part of our work now focuses on the concept of a transport Super Hub at Langley Mill – where the tram extended from Phoenix Park through Kimberley & Eastwood would terminate. There would then be a fast link from Langley Mill through to the new Hs2 Hub Station in Toton, and options for electric buses from Langley Mill through Codnor to Ripley. Our key aim is to bring jobs, investment and growth to the north of Broxtowe and Amber Valley – especially – Kimberley, Awsworth, Eastwood, Langley Mill & Heanor – areas that are often left behind and forgotten about. Reducing travel congestion is also critically important. Our aim is not to replace any existing bus services, only to improve public transport and offer more choice to the public & reducing the need for car journeys. If you would like to get involved in any way, please let me know. Some of you will be familiar with the TV shows from two decades ago – Yes Minister (and Yes Prime Minister). Here you would see frantic, yet at the same time humorous attempts by civil servants trying to find all sorts of ways to delay/obfuscate/prevent something happening. On this particular matter (Nine Corners) and the one below (wall demolition in Kimberley) – a quite simple request by myself on both matters appears to be at a quite farcical level (though it is definitely not funny and I am singularly unimpressed). For example I am struggling to understand the attitude of the County Council about the crossing for pedestrians near Nine Corners in Kimberley. These details were submitted to the County Council on 27 February 2018 – along with copies of the complaints and suggestions I have received from local residents, many of which were very interesting. In a response I received from the County Council dated 3 May 2018 there were bewildering contradictions. I have formally asked that their decision not to take action be reviewed and I have also offered to meet County Council officers in person to discuss further. On the 29 July 2018 as I write – this matter still remains unresolved. Hopefully come September there will be substantive news to report. Again, this is bordering on something quite ridiculous now. I was asked by a number of residents living close to Ruislip Close whether a large wall can be demolished in one of car parks, with one of reasons being incidents of anti social behaviour that takes place behind it. I duly made some enquiries at the moment to see what actually can be done about this, what consultation is needed, and what any costs would be. 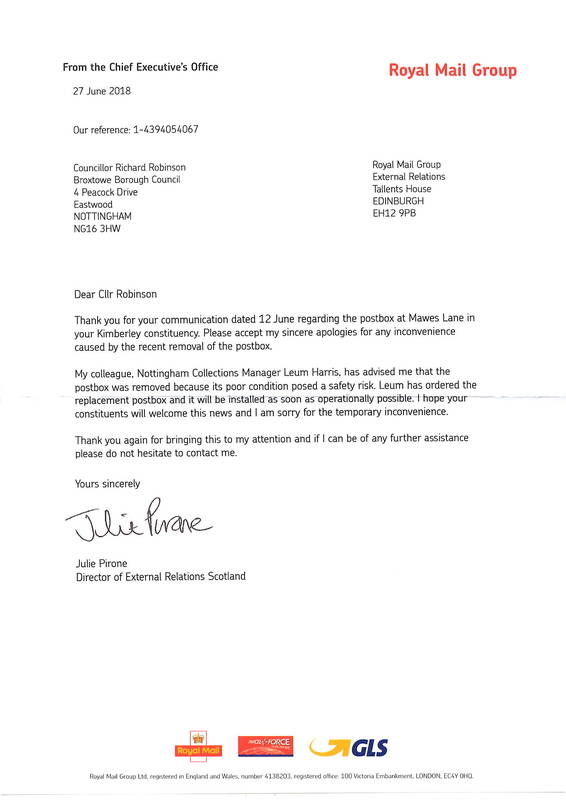 From what I can understand from officials at Broxtowe there appeared to be a dispute about land ownership, which I was hoping would be clarified soon. There now seems an impasse with the County Council – who, having been passed the matter by Broxtowe, do not appear to want to engage. I’m going to wait until September to give the County Council further opportunity to respond, before deciding what further action to take. I have been notified of instances of vandalism taking place at the open space on Millfield Road recently. I have reported this to the police, and if anyone has any further details if they can let me know and I can liaise with the police accordingly. Many of you will be familiar with the excellent work undertaken at the dog rescue in Kimberley. I have mentioned their work a number of times in newsletters over the past few years. Currently they are trying to enhance the work they undertake with the rehabilitation of rescued dogs and are proposing to build a polytunnel, which happens to be in the Green Belt. As I understand the current position with the planning application with Broxtowe Borough Council the polytunnel and does not meet any of the criteria for appropriate development in the Green Belt, therefore being inappropriate development. The applicant will need to demonstrate ‘very special circumstances’ in order for the scheme to receive officer support. Following public consultation, over one hundred letters of support for the application have been received to date, with a handful of letters of objection – mainly citing its appearance, position within the green belt and impact on traffic as reasons for objection. This matter is likely to be referred to the Planning Committee at Broxtowe for consideration on 12 September. Rumbletums Cafe and Training Project was set up to offer vocational training and work experience placements to young people and young adults (16-30) with learning disabilities. I believe one of jewels in the crown that Kimberley has is Rumletums café. They are an absolutely excellent organisation whom I have had much contact with over the years. I last met with Jeff Buck one of its founders and champions – on Wednesday 11 July to discuss their current predicament – namely for the previous seven years, Rumbletums has rented its premises at a discounted rent, but now the landlords want to sell the building within the next year… at a cost of £200,000. Rumbletums is therefore faced with having to buy the premises, move out or wind up the project. Yesterday along with Jacquie Sainsbury (Head Teacher at Brookhill Leys Primary School in Eastwood) and Kimberley resident Ellis Tansley – both Labour candidates for Kimberley in the borough elections next year (more about this in September’s newsletter) – we talked with a number of residents on Orchard Street Kimberley about the dangerous parking issues. Residents offered a number of solutions for improvements and we will be contacting the County Council in due course. This entry was posted by Richard Robinson on July 29, 2018 at 10:56, and is filed under Newsletter. Follow any responses to this post through RSS 2.0.Responses are currently closed, but you can trackback from your own site.